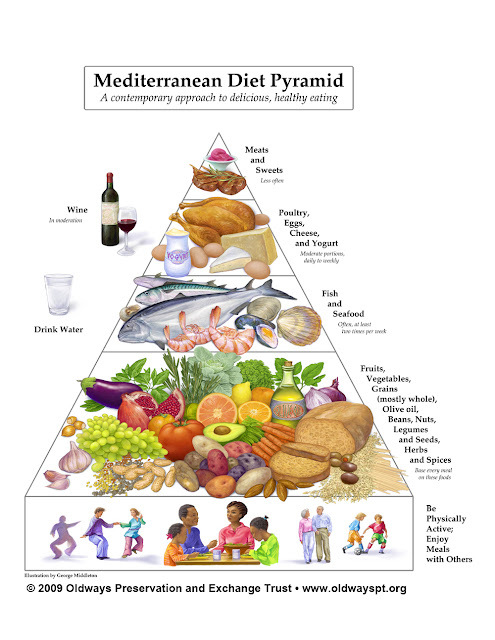 The Mediterranean Diet Pyramid. Used with Permission. Here in Vancouver, it has been a chilly spring but today the sun is blazing. I am reminded that May is the month when the sun warms the earth, we shake off the layers, embrace a lighter style of eating and thoughts turn to spring fresh produce. Which makes May the perfect month to raise awareness of the Traditional Mediterranean Diet. Far from being a fad, the Traditional Mediterranean Diet (let's call it TMD for short!) is a way of eating and living for lifelong health that is based on the traditional foods and eating habits of Mediterranean cultures. When it comes to eating well, I have always believed that a diet of whole, natural foods is the only way to go. The TMD fits this model well. First introduced in 1993, the diet pyramid was created by Oldways Trust with the Harvard School of Public Health and the World Health Organization. Since its introduction, research has supported the health benefits of the TMD but most importantly, it is a sane way of eating that people can enjoy for life. I recently had the opportunity to ask Georgia Orcutt, program manager for Oldways and the Mediterranean Foods Alliance, a few questions about the Mediterranean Diet and how we can all incorporate this healthy eating plan into our lives. What makes the Traditional Mediterranean Diet different from the typical North American eating pattern? It's tricky to identify one typical North American eating pattern, since a number of regional foods and cultures still exist in the US. But undeniably, the North American diet today for many people is one that relies heavily on processed foods that are high in sodium, sugar and unhealthy fats. The Traditional Mediterranean Diet, in contrast, has at its core vegetables, fruits, whole grains, beans, nuts, peanuts, herbs, spices and healthy fats such as those found in olive oil. These are foods to eat daily. The emphasis on healthy fats is a big difference between the two patterns. While it's typical in North America to eat meat three meals a day, with the Mediterranean eating pattern, if you eat it at all, include small amounts as a garnish, and as a main course limit the portions to 3 ounces or less. Or plan to enjoy meat as part of a celebration, not as daily fare. The Med Diet also suggests eating seafood twice a week and building vegetarian meals around beans, whole grains and vegetables, heightening the flavor by using herbs and spices. There has been an impressive amount of nutrition research on the Traditional Mediterranean Diet. Have a few key foods in the diet been shown to account for many of its health benefits or does the TMD pattern improve health more than any individual food? While there are some "superfoods" in the Traditional Mediterranean Diet that stand out for their antioxidant properties or nutritional profiles, in promoting the TMD we align our messaging with the latest Dietary Guidelines that place an emphasis on the whole diet. (I'll add here that the guidelines also, for the first time this year, offer validation for the Mediterranean eating pattern!) Consumers frequently misunderstand research that highlights nutrient profiles of specific foods. Encouraging people to eat a wide variety of fruits, vegetables and grains is very important. Think lots of colors and flavors on your plate. Given that our current eating habits rely on unsustainable manufacturing and shipping processes, will adopting a Traditional Mediterranean Diet be a more sustainable way of eating? Does the diet lend itself well to a local foods approach? Sustainability is a very complex issue and we need to all become agents of change in our own lives. Since the Mediterranean Diet places an emphasis on eating lots of vegetables and fruits, eating seasonally and shopping at farmers markets when possible is an ideal way to support local agriculture. Growing your own vegetables and fruits is a great goal, too. But not everyone can do this. It's also important to keep an eye on what choices we make in our busy, everyday lives and how this can impact sustainability. If you stock your pantry with Mediterranean basics such as pasta, rice, tuna, canned tomatoes and spices, and you have seafood, nuts, grated cheese and vegetables in your freezer, you can come home and make a home cooked meal, rather than running out the door and supporting a fast food franchise. Habit change can be challenging for many people, especially where diet changes are concerned. What do you think are the most difficult changes to make when adopting the traditional Mediterranean diet and how can they be overcome? Taking small steps, one a day or one a week, can be the best way to make positive, healthy changes in the way you eat. (Author's note...UnDiet!!) Because we are all such creatures of habit, it can be very difficult to understand and consistently follow through on portion control and creating a Mediterranean-style lunch or dinner plate that looks different than what we are accustomed to seeing. (i.e. a variety of vegetables, smaller amounts of meat., 1/2 cup of pasta or rice). It's important to keep meals simple and easy; aim for making every meal taste great and to eat nourishing foods that promote satiety. We outline these 8 simple steps to help people learn how to adopt the Mediterranean eating pattern: Eat lots of vegetables; Change the way you think about meat and if you eat it, add small amounts to vegetable sautés or use as a garnish for a dish a pasta; always eat breakfast; eat seafood twice a week; cook a vegetarian meal one night a week, and then aim for two nights a week; use healthy fats in daily meals, especially extra-virgin olive oil, nuts, peanuts, seeds, olives, and avocados. In addition, we encourage consumers to discover the wide variety of delicious Mediterranean foods at the supermarket and learn how to routinely break old habits and make healthy substitutions. For example, buy Greek yogurt and use that instead of sour cream; sample different varieties of hummus, find your favorites, and use that in place of mayonnaise. What one step can readers take today to bring them closer to a Mediterranean diet? Go to your local supermarket and spend a few minutes just looking at the fresh produce. Buy one vegetable you've never tried before, take it home, search the web for that vegetable paired with the word "Mediterranean” and find a tasty way to prepare it. 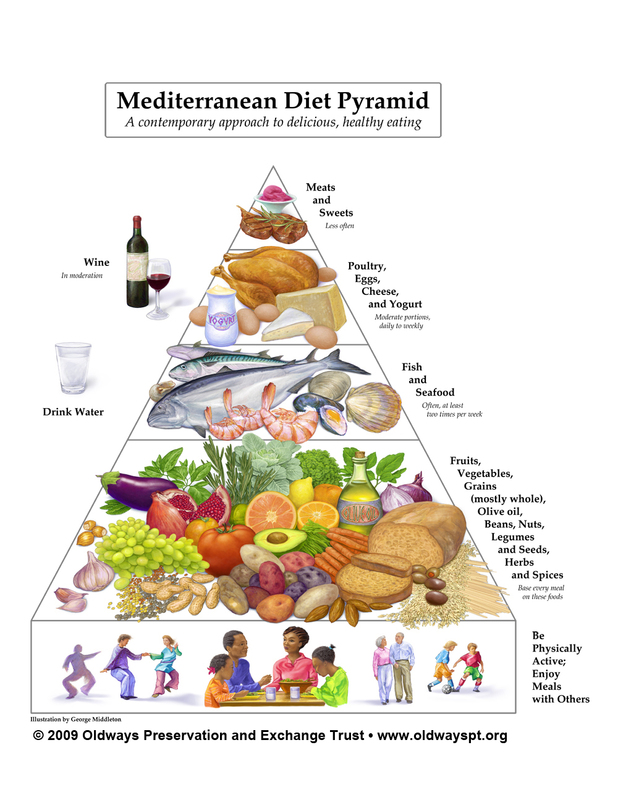 Learn more about the Mediterranean Diet and download your own diet pyramid at http://www.oldwayspt.org/ and like Eat Drink Be Happy on Facebook for a chance to win a copy of The Oldways Table: Essays & Recipes from the Culinary Think Tank by K. Dun Gifford and Sara Baer-Sinnott.